Written by tevensso on July 7, 2006 to Editorial. “Neverending Love” was an English version of the song “Svarta glas” that Per had composed for Swedish artist Pernilla Wahlgren. She turned it down, and gave it to her brother Niklas Wahlgren who recorded it and was about to release it when EMI called his record company and told them to remove the song from the album; Per Gessle needed it himself, but in English, and together with hot rock artist Marie Fredriksson. Enuff said. When the single was released Per, 27 and Marie, 28, didn’t want their picture on the sleeve, therefore a ’50s style drawing was used. The song went straight into the Sommartoppen chart, I don’t remember how high the first week, and as a matter of fact, I was in the USA so how could I? I arrived back in Sweden on July 16th after 11 months in the US as an exchange student. I met up with my friend who immediately told me that Roxette had a new song out. That’s not possible, I said. Roxette broke up last year. So he gave me the 7” single. I was blown away. In June 1985 Gyllene Tider called it a day, and here was a new Per Gessle project! Amazing! There was a God after all. So I turned the record on… and was disappointed… I felt Per had sold himself to Eurodisco. Nevertheless, I started listening to the one song, hoping for more, and needless to say, it grew on me. Now it’s 20 years later, I’m 20 years older (what happened?) and Roxette is still with me. And Roxette has sold over 70 million records so far. Quite a feat for two timid “hillbillies” from the south of Sweden, don’t you think? 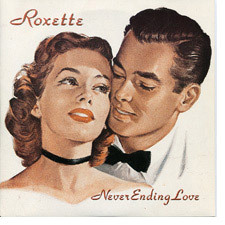 Neverending Love should be in the Rox-box ’cos if not it won’t be a 20-year thing but an 18-year one! perfect history..ohh my ...how do I love them! Oh my God!! !20 years!! !20 years ago i was 9,but today i love ROXETTE MORE THAN EVER!!!! You are so funny Tev! Drawing a *20 years old* fine line, a neverending song! So today Roxette turns 20. in three days I have my 20th birthday as well. Is anybody closer to Roxette? I was 7 years old and I couldn’t imagine that 5 years later I would listen to a band from a country so far from here and that I would become a giant fan as I am today. I wasnt born yet ;) 20 years today then? I really hope we get some solid news about the upcomming releases soon - I soooooo can not wait ! I have even wished the Summer away ! And I almost NEVER wish time away ! tevensso says: ... Now it’s 20 years later, I’m 20 years older (what happened?) and Roxette is still with me... and I say: I feel the same feeling about it. thanxs tevensso for telling us your nice story :-) really nice and cool! me again over here. neverending love! the perfect way to call the feeling about roxette: the story, the music, all the feelings are just like A NEVERENDING LOVE :-) thxs Marie, thxs Per... ... .
It’s so amazing it’s been 20 years that Roxette has been filling our lives with innumerous moments of hapiness and intense feelings described by silly little words in the lyics to shouts and to the melodies within the songs we’ve all come to love in one way or another. For many of us, Roxette has been an important and constant part of our lives. Many of us can’t really describe or write about themselves or even about their lives without thinking of or mentioning Roxette. Also, for many of us, if Roxette had not been part of our lives as we grew up, we definetaly would be somewhat different people nowadays. @ Robrox, sorry I beat you to it! Today is my “Födelsedag” and I am 29!!!!!!! …it’s nice to share your day! 20 years ago I was only 5 years old and attending primary school. 6 years later the girl next door gave a (copied) tape of Look Sharp and said hey, here you have a tape with music that I am sure will fit your style. Well, things got out of hand and now I have been a fan for about 14 years! wow in 1986 i was -6 monts!! actually Joyride was my first ever tape! I guess it‘s a small world cos IT WAS the girl next door who gave me the copied tape! ever since i can‘t stop listen to Roxette and now it‘s some 15 years later! thanx for the extraordinary 15 years Rox! now I just can‘t image what it would have been like without you! All the best and more from Bulgaria! 20 years eh?? Not a bad career I feel. lol!! Nice to know that there are some bands that can stay around for longer than 15 mins. Makes the whole music business seem a little bit better! I was 9 as well, but didn’t learn about Roxette until 3 years later. It feels strange to be already older than Marie & Per when they started this whole thing... 20 years – how fast time is running!!! Marie and Per really have something to be proud about, their music will live much much longer! I was only 5, and had been to my first school for only a few months. I was 2 years old, but didn´t I didn´t become interested in music until I was 5. All thanks to The Look. Ally and everyone else who is born on this day, HAPPY BIRTHDAY! In July 1986 I was 5, altmost 6..... and I remember the first Roxette song I ever heard: IMHBL in 1990, from a hits compilation, I think. But I didn’t become interested in them until early 1992, when a friend in school copied Joyride for me. I remember that the first time I heard the tape I thought “how boring!” However, I began to hear it again and again, and so far, I think is my most heard tape ever (I still have it, and I don’t think it’s audible anymore! It’s amazing.. I’m 27 years old now.. the same age that Per had by the time when Neverending love came out. Now I know how will I look 20 years later. I wonder if Per and Marie remember this actually day and if they did anything today... would be nice to know! Yeah It could be nice to know if they did something. Besides recording the 2 new songs. But maybe they didn´t realize. Any news on the swedish newspapers or TV??? 20 years! I was 9, I was at school, or probably I was on winter’s holidays... time flies! Congrats, Marie & Per!!!!! And all roxers around the world! great, 20 years of beautiful music, great songs, marie with the voice i like most of all female artists, per’s melodic songs i adore mostly. they gave me the music i needed in these 20 years, near 20 years, i’m on the roxette train since the look came out. i know the first time i heard the look in front of a rollercoaster here in town. it was such a cool song and they played it every 30 minutes. we had really a roxette fever here in zurich (switzerland), what a great time. now near 20 years later and about 10 live concert later, i’m 31 and i need the music like in the beginning. every song has a imagine of old times, every one. pictures are coming up when i, for example, hear the first strings of cbb or ltyh. (i remember the girl i kissed first in my life during ltyh was playing). i hope marie and per know how much they gave us with the music and tours etc. for me it is really a really big thing. thanks so so much for this and i hope you will give us more of it. i will ever be a great fan of both of you. god bless you! Happy Anniversary, Per & Marie - thanks for a great (joy)ride these last 18 years I’ve followed you! You’ve always remained true to both yourselves and us fans, never sold out to the media vultures... for that you deserve the ultimate respect. You guys freakin’ RULE. HAPPY BIRTHDAY to the best band in the world!!! I did not know the song was originally written for someone else. I was 4, got into Rox when i was 7 i saw them on TV. Ummm... couldn’t anyone look up to WHY they didn’t want their faces on the cover? Or, was it an EMI strategy after all? Or how high the single charted on the sales charts in the first week of release? I know it eventually made #3 but I would’ve appreciated a more factful article based on the single and the group itself rather than someone’s US trip or personal affairs with Roxette. They didn’t want their faces on the sleeve because they wanted to be “Roxette,” not boring old Per Gessle and Marie Fredriksson (who were already familiar names/faces in Sweden). This is probably the only article in the world on the subject... the other media seemed to have missed it. As far as I know, the reason for the use of the drawing (as opposed to photographs) is that Marie said that she didn’t want her photograph on the cover so that people wouldn’t associate it with her because everyone warned Marie against going into the Roxette project for fear that it might damage her solo-career. At least that’s what I read. HAPPY BIRTHDAY ROXETTE!! LIFE ONLY TRUELY STARTED ON THIS DAY 20 YEARS AGO!! i like this old pic. it´s nice and nostalgic. Exactly. So why fall into a subjective “It’ll be 20 years on July 11” type of essay? I like the cover, it’s like those covers from the Smiths albums with classical cinema actors on them. More covers like these would have been cool. Ahh 1986, what a year! I finished primary school, and out came the first Roxette single... Shame us Aussies didn’t experience the Marie & Per phenomenon til 1989! 20 years and still young,jee!Happy-great day Roxette! All credit to Thomas for the article, it was good work! In July 86 I was 8 years and 4 months old and I was look forward to holiday in Yugoslavia. I became a Roxette fan in 1992 - a bit late I think (14 years). I was not interested in music till my 14 years. What a pity!!!! 20 years ago today, I was 11 and living in England at the time. I may have been exposed to Roxette at that time, but don’t really remember until I heard The Look almost 6 years later, at 2 in the morning while in a hospital room. Since then, Roxette has been a mainstay in my music selections and a bright light in an otherwise dismal world. Thanks to Per and Marie for all that you’ve done for a lot of us. They are not just a music group i like, they have become part of my life. There is a Rox-song for each minute of the day, for every mood you are in. Roxette: Thanx for all those great years, i love you! I hope more great years will follow. It’s great for me to know that Roxette turns 20 and I have been listening to that wonderful music for 15 years. :) So much time! Go on singing for many more years!!!!!! I love Roxette!!!!! Wonder what the plans are for the 21st next year!!!!! @animalkingdom - why can’t you just be happy with what you get??? I’m sure you can find the information out on the internet, but instead you just winge about the news story here. I actually liked the news article, i think it makes it more interesting when you have someone’s personal view/story with it. But than just a load of old number, dates, charts positions. OK, so everyone else liked the article, I didn’t - - what’s the big deal? Am I not allowed to share my sincere opinion? I remember people here mocking Marie’s The Change & Roxette’s material saying that just because they like the music (in general) they don’t have to be happy over everything. Same here. I just didn’t happen to like what I read this time. I was 5yo, and I think i was in Macedonia for a family holiday at that time, would’ve been another 6yrs till I found out about Roxette in 1992. I quite liked the article, not at all what i was expecting when i saw the title. i was 5 years old at that time. i hadn´t even started kindergarten yet and i wasn´t keen on music at all. anyway, 5 years later i became a rox fan and so have i been so far. who would have thought roxette would last so long? I was 14 when that single was released, but here in the US, the first taste we got of Roxette was “The Look”. The music sounds just as good today as it did back then. And the “Joyride” just keeps on going. Happy 20th “Rox” Anniversary, Per and Marie!!! In 1986 I was five, hadn’t quite started kindergarten, cuz it was summer. I didn’t know Roxette till 1990, but didn’t really get into them till 1991 with “Fading LIke a Flower” and “It Must Have Been Love”. By April, 1992, I got Joyride for my birthday, and the rest is history... Good job you guys on 20 years!!! Wonder what there plans are for the 21st!!!!!!!!! No idea, but loving the picture!